Does Your Company Have a Hazardous Materials Communication Program? Unfortunately, many workers are exposed – wittingly or unwittingly – to hazardous materials during the course of their jobs. According to the Occupational Safety and Health Administration (OSHA), this problem affects over 3 million workplaces in America, which expose a combine total of 32 million workers to hundreds of thousands of hazardous materials. In order to ensure that your employees understand the risks associated with various chemicals and other potentially dangerous materials, and take the necessary precautions to protect themselves, you need a hazardous materials communication plan. In fact, you are required by law to have such a plan. With help from a company like H2 Environmental Consulting Services, you can easily create a hazardous materials communication program, using OSHA’s Hazard Communication Standard as a model. Your plan should include these three main components. You must perform a survey of your workplace and inventory all hazardous materials that are normally used by employees and/or stored on the premises. All such materials should be clearly labeled with their chemical name, trade name, or common name, and the name used on your workplace chemical list must match the name on the label. You should update your workplace chemical lists frequently—either quarterly or annually. Material Safety Data Sheets (MSDS) must be created for each hazardous chemical, following OSHA standards. These informational resources should contain a description of both the dangers posed by the materials, as well as safe handling practices. MSDS should be made available to all employees who will be exposed to the hazards that they describe. In addition to compiling information about all hazardous materials involved in your business, you must ensure that employees know how to utilize this information. This means training employees to read and follow MSDS recommendations, as well as informing them about their OSHA rights. You will also want to train employees to recognize spills or releases of hazardous materials and responds appropriately. This will involve utilizing safe, approved cleanup techniques and the notification of any relevant authorities. Because health and safety standards are always evolving as medical science progresses and we learn more about the effects of various materials, it is important to invest in regular reviews of and updates to your hazardous materials communication program. 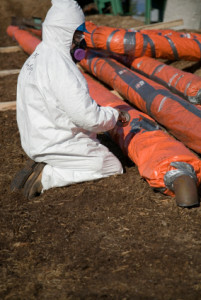 When you hire a company like H2 Environmental Consulting Services to help you, you can rest assured that you are getting expert assistance with this vital activity.